Leamington boss Paul Holleran says the loan signing of Callum Powell will allow Ahmed Obeng to wreak havoc in the closing stages of the campaign. With Powell on the left flank, Obeng revelled in a free role on Saturday, putting in a man-of-the-match display as Brakes got their promotion bid back on track with a 5-0 thrashing of Dorchester Town. 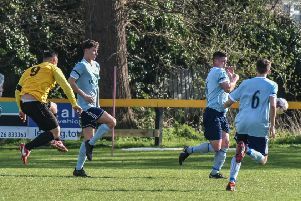 Obeng scored the opener and was a constant threat on what Holleran described as a perfect afternoon for his side after a stuttering start to 2017. “It was the best pitch we have played on for a while and it was helpful that a lot of our good players were playing in their ideal positions. “It’s good to have Jamie Hood back and it was an ideal game for Jordan Goddard to come into. Brakes have a chance to well and truly extinguish Chesham’s play-off hopes when they travel to The Meadow tomorrow. Four defeats in their last five have seen Chesham lose pace with the top five and Holleran says their slump has been of a direct consequence of them playing catch-up. “They’ve had a few bad results recently, but three weeks ago people were still saying Chesham could win the league. Nevertheless, Holleran is refusing to take their challenge lightly. Despite their slump, the Generals have only lost once at home all season and Holleran says he has a decision to make as whether to show faith in the side that beat Dorchester or employ a more defensive formation. “The good thing about the squad is that we have decent depth,” he said. “We’ll have a look at it. Ideally, you want to say to that XI, off you go, hit the same levels as you did last Saturday. “We go there full of confidence, with everyone fit and in a strong position.